Anyone with a penchant for UK sportsbetting could tell you that Ladbrokes are one of the oldest and most respected bookies in the country. For as long as many can remember, their small red betting shops have been spread liberally throughout towns and cities. 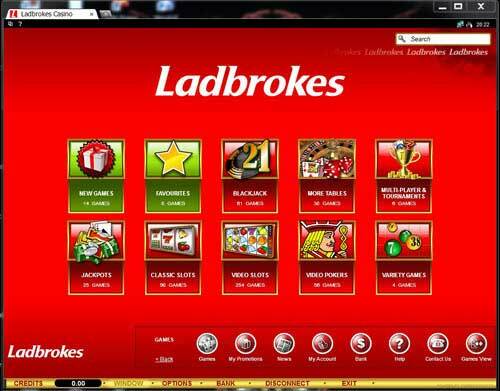 When the online gambling revolution came, Ladbrokes wasted little time jumping on the bandwagon and are now among the major players in everything from online poker to bingo. In particular, their casino has attracted in a huge number of players from around the world, thanks to a solid reputation and quality design. Its casino client and games are provided by Microgaming Software Systems Ltd, an experienced company which has been creating custom online casino software for as long as there have been online casinos. There’s a huge variety of games on offer at Ladbrokes Casino. All the casino stalwarts are in place, from Blackjack to Roulette. 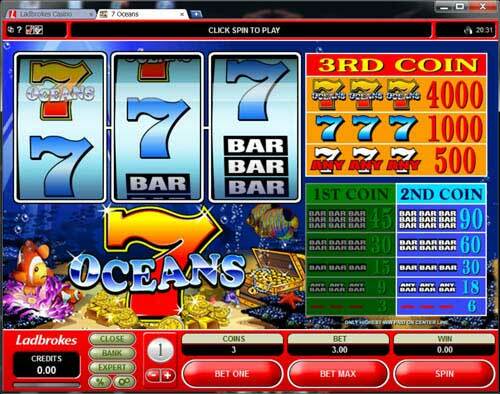 Slots of all different shapes and sizes are available, with multiple reels and eye-catching designs to keep your attention for hours. Huge progressive jackpots, video poker machines, and scratchcards are just a few of the other gambling options available. If you’re tired of these well-worn titles, do not fear. 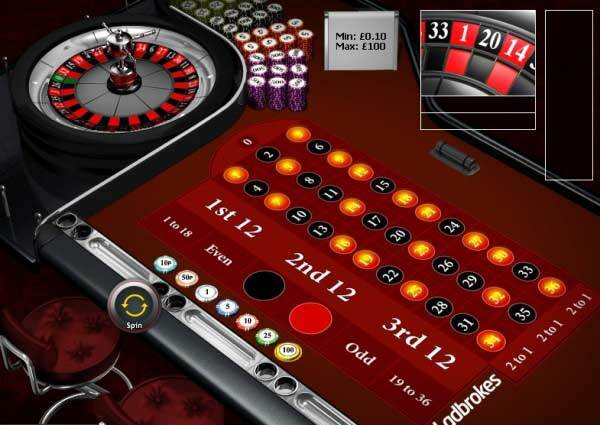 Ladbrokes Casino has plenty of new and exciting games designed exclusively for their customers. Registered users at Ladbrokes will not be short for bonus cash either. First deposit bonuses and regular game-specific competitions are running 24/7. There are two ways to get yourself into the action at Ladbrokes Casino. The first and most direct method is to use the in-browser client. 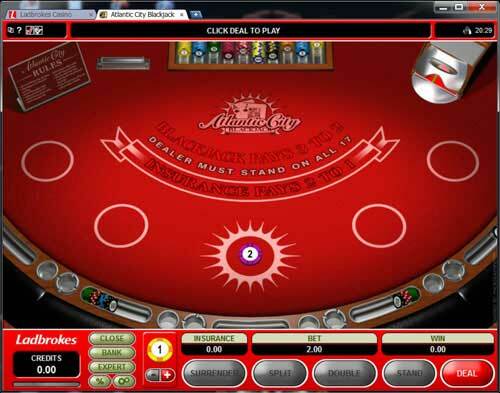 Unlike many other online casinos, Ladbrokes do not provide a whole java copy of their downloadable software. Instead, you use the website to find the game you want to play, click on it, and a separate window opens up for that specific title. This is great for playing on the move, but most people will want to take a few minutes to download and install the fully featured client. A quick glance at the Ladbrokes website should make it plain that they like their red. True to form, the entire Ladbrokes Casino client is covered in a vibrant shade. You’re first decision when logging on, is deciding which type of title you would like to play. The lobby presents large graphical buttons for Blackjack, Table Games, etc, which reveal a list of every game of that type when clicked. Most of the titles will not have been downloaded at this stage, but can be loaded and ready to go within 30 seconds. If the grid of all the available Blackjack games is overwhelming, you can filter it using tabs to display only ‘Multi-Hand’ and ‘Single-Hand’ games. Similar filters exist for all other game types. Although the grid can look a little cluttered, it is relatively easy to get around and find the games you are after. Mousing over each button will display the details of the table, so you can see what the various different names actually amount to. If you like to keep up with the latest developments, there is a special ‘New Games’ section where you can choose from all the most recently added titles. To avoid excessive navigation, Ladbrokes Casino also provide you with a ‘Favourites’ section, where you can store your most played games. If you’re looking for an online casino with plenty of games to choose from, you can’t do much better than the 460 that Ladbrokes currently provide. That’s far more games than you’re ever likely to play, with everything from iterations on the classics to exclusively developed new titles. There are more games added every month, so expect to see that total tipping over 500 before too long. 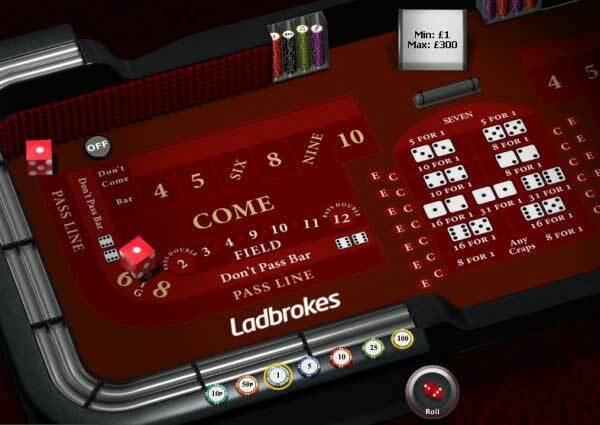 All the Card and Table games you would expect to find in a casino are easily located at Ladbrokes Casino. All of them have multiple version and varieties so that you can find that perfect Blackjack experience or most complex Video Poker machine. Slot machines are a worldwide favorite and there are plenty of them to be enjoyed at Ladbrokes. From single reel machines to convoluted multi-reel behemoths, there are slot machines to suit any kind of player. Blackjack is also well accounted for, with 2 to 8 deck games on offer along with Multi-Hand, Single-Hand, and High Limit tables. Another casino staple, Roulette, is not quite as well covered as Blackjack, but there are still a few different varieties to choose from. French, European, and American Roulette all find a place at Ladbrokes. For such a popular online casino, you might hope for a greater selection of deposit options than Ladbrokes provide. However, most players should be able to find some way of getting their money into their accounts and ready to hit tables. Before you make your first deposit, be sure to take advantage of the £50 Free no deposit bonus Ladbrokes Casino are currently offering. The minimum deposit amounts provided on most of the finance options are pretty low, if you’re looking to make a budget entry into the world of online gambling. The following banking services allow you to deposit onto Ladbrokes Casino: VISA, Mastercard, Maestro, Switch, Solo, PayPal, NETELLER, ClickandBuy, Ukash, Bank Transfer, Western Union, Moneybookers, and Ladbrokes Shops. 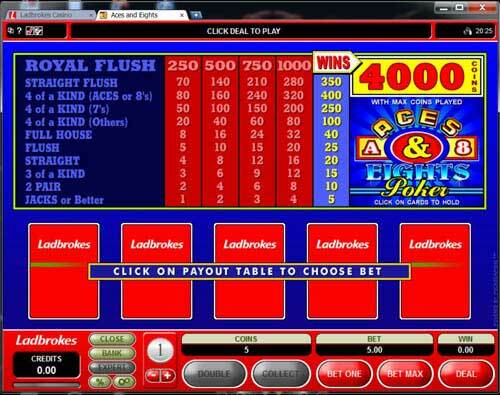 If you want to fully cash out any of your winnings or bonus haul, then there are almost as many choices. You can transfer money back to your bank account or e-wallet using: VISA, Mastercard, Maestro, Switch, Solo, PayPal, NETELLER, ClickandBuy, Bank Transfer, Western Union, Moneybookers, and Ladbrokes Shops. NOTE: The bonus offers described below are for UK residents only. If you are located in another country, these offers may not apply to you. Make sure to check the Ladbrokes website to see which offers apply to your country or region. Knowledgeable players signing up at a new online casino will usually be quick to scout out their first deposit bonus offerings. Ladbrokes Casino does have a solid Welcome Bonus deal at 100% up to £500 on deposits as low as £20. Make sure to enter the Ladbrokes Casino promo code FTRBONUS when you create your new account as this bonus is only for new players. The money appears in your account immediately, but to prevent you from cutting and running with the cash, Ladbrokes require that you play through at least 20 times your bonus amount before you can withdraw any winning. They recognize all of their 300+ Instant Play games toward this wagering requirement, but each pound you wager counts more on some games than others. When it’s time to withdraw your winnings, the bonus amount will itself be removed from your account. So if you deposit £100, receive a £100 bonus and run your balance up to £1,000, you’ll only be able to cash out £900. The £100 bonus value will be taken out of your balance. There are numerous of other promotions at Ladbrokes, with new offers arriving to fill the places of expired deals almost every week. Examples of their recent events include free slot machine spins and a £2000 turnover race. There is also a VIP Club for those players with wallets stuffed enough to make really large wagers. If you play over 7,500 chips in one month (£7,500), you are automatically granted entry into this exclusive area. You can now use the secret VIP Lounge with high stakes tables and earn VIP Rewards that include cashback on your losses. There are monthly bonuses just for VIP members and even free tickets to a whole range of sporting events and shows. The Ladbrokes Casino support team is available 24/7, but many support issues can be solved without contacting a representative. Ladbrokes have laid on a in-depth Self-Help section, containing solutions to a long list of the most common problems. If you do feel the need to contact support, you can get in touch via email or phone. There are phone numbers for the UK and International and a whole range of different email addresses, depending on your particular problem.